I have been very spoilt, visiting all the distilleries and going on fun day trips and outings. It feels like we were on the go every day! There is so much to see and do in the Cape Winelands area. During the days following the holidays, I visited Wilderer Distillery, New Harbour Distillery and Hope on Hopkins, both in Cape Town proper, Durbanville Distillery and Fynbos Distillery at Sir Robert Stanford Estate. I've linked all the articles to the originals at World Craft Distilleries, which I set up just for this purpose so am not going into details about these amazing places on this blog. But what I will comment on is the fact that every one of these distilleries is absolutely unique in its own way. And all the distillers, whether retired executives or millenials, are so enthusiastic and passionate about what they are doing. And one of the best parts is that there is a good amount of cooperation and sharing between them. This is such a young, rediscovered industry that there is a lot to learn. The problem with not writing these posts "as it happens," I miss events, even as I go back through my photos. So this may be a bit disjointed as I talk about the trips we went on! It seems like every place to visit is about an hour to an hour and a half to visit. 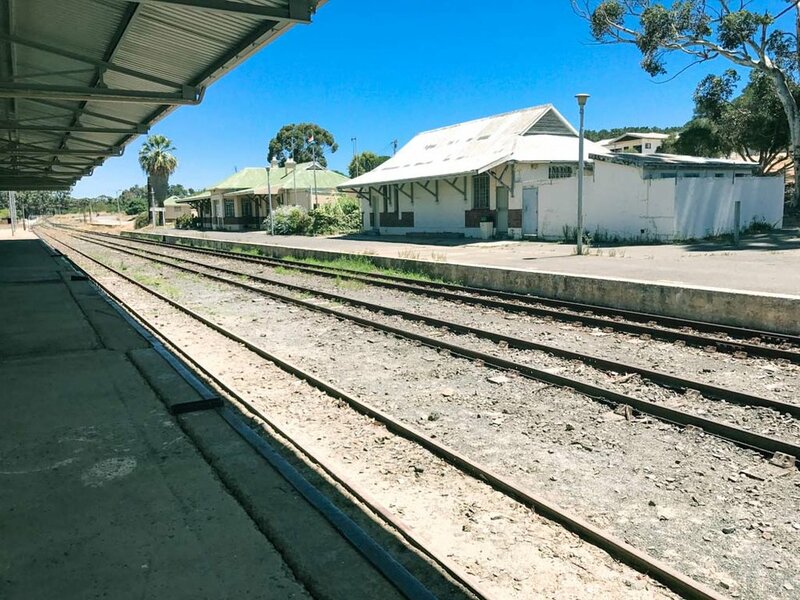 When we had visited Honingsklip Brewery near Bot River, Biff and Julie mentioned another place they wanted us to visit called The Shuntin Shed, a restaurant in the old railway station at Bot River. Plans were made and we added it to the diary we decided to keep, in order to keep track of our plans. On the way, we stopped at the Dassiesfontein Padstal, a place that was originally a farmstall but now houses the most amazing collection of kitch, local products, junk and just stuff! It's actually overwhelming, with so much stuff it difficult to actually see anything! There is a restaurant there as well, which apparently is good, but as we were heading to The Shuntin Shed, decided to forgo food. And none of us bought anything. It's as if people stop by there just to be amazed. We picked one of the very hot days and unfortunately, the restaurant was stifling! 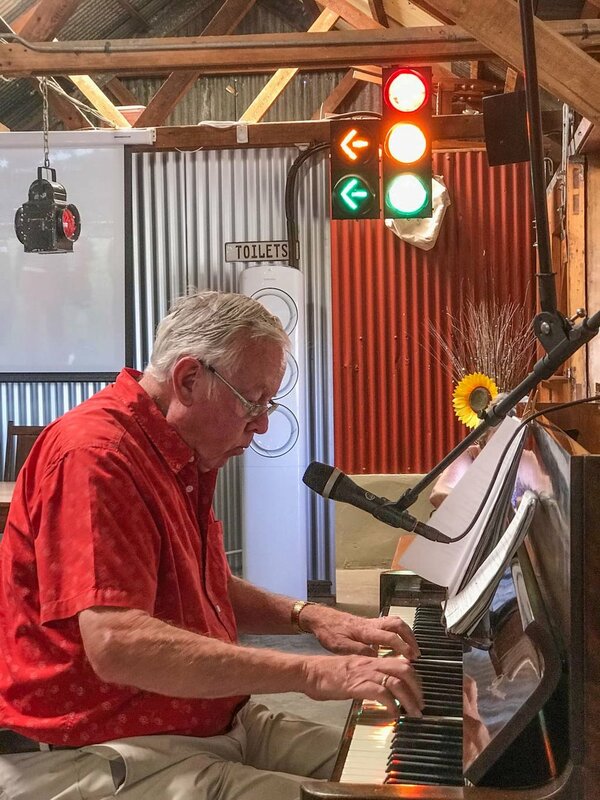 Other than that, which we managed to mitigate a bit with icy cold beers, it is a really fun place, with an old dude, jazz pianist "Al" Jeffery on the piano (only on Sundays) and a great atmosphere. They have good pizza as well, which Zoze and I split. We have learned that the serving sizes everywhere are "huuuuge" so we tend to share a lot. Heading home, we took a detour towards the small town of Greyton. Thinking it wasn't very far off the main highway, we were surprised by the distance, but enjoyed the very different, lush scenery. This caused Julie grief as Villiersdorp is on water rationing and the valley we drove through has a river and wetlands feeding the farms. Along the way, out in the middle of nowhere, miles from anywhere, (something quite common in South Africa) we went by these guys pushing a car! No housing/houses/villages etc anywhere close and we had to wonder where the hell they were going! There are actually a lot of "shake your head" moments here! When we got to Greyton, we discovered a very pretty old town, but not a soul around. The only sign of life were a couple of horses wandering around! It was Sunday afternoon so can only assume everyone was snoozing!